Once Upon a Time… There was this crazy dog lady who treated her Chihuahua like her child and would even dress her up in outfits like she was a human. The lady was out to dinner with her fiancé at a restaurant that had wild peacocks roaming the patio area and she made the comment that her furbaby, Peanut, would probably love to play with the peacocks. The fiancé wasn’t listening to the lady talk (this was not an unusual thing for him to do) and when the lady noticed that he wasn’t paying attention she asked him, “are you even listening to me? !” The fiancé insisted that he was listening so she asked him to repeat what she had told him as proof that he was in fact listening to her. 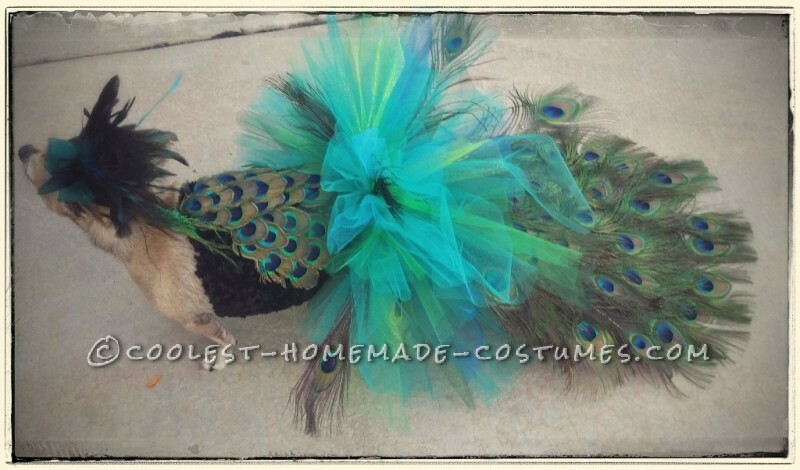 He confidently responds, “You said ‘I bet Peanut would love to play a peacock”…. The lady looks at him as if he has sprouted a second nose because not only was he not listening but it made no sense whatsoever, why would a Chihuahua want to play a bird? How would a Chihuahua play a bird? Act it out? Play it like an instrument? As her mind went through all of these questions an idea was born. 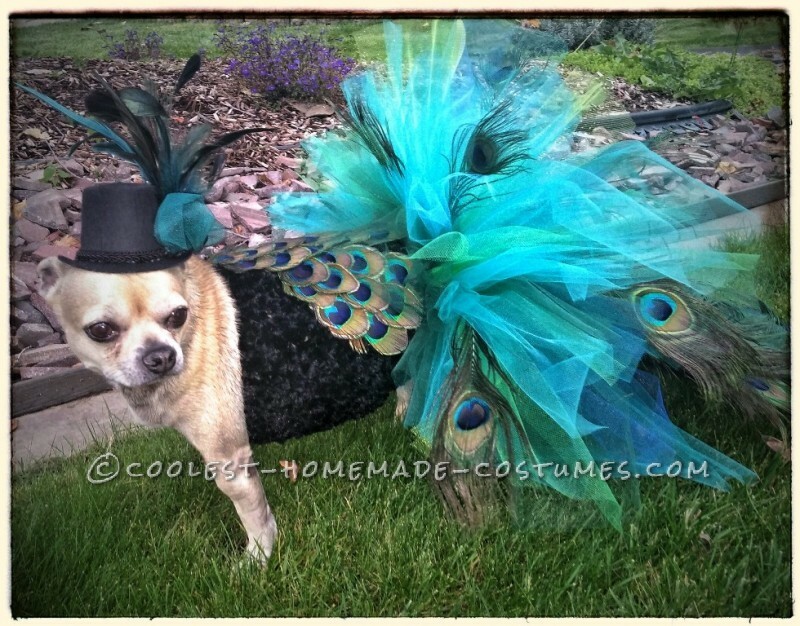 Halloween was quickly approaching and maybe her dog WOULD love to “play” a peacock. 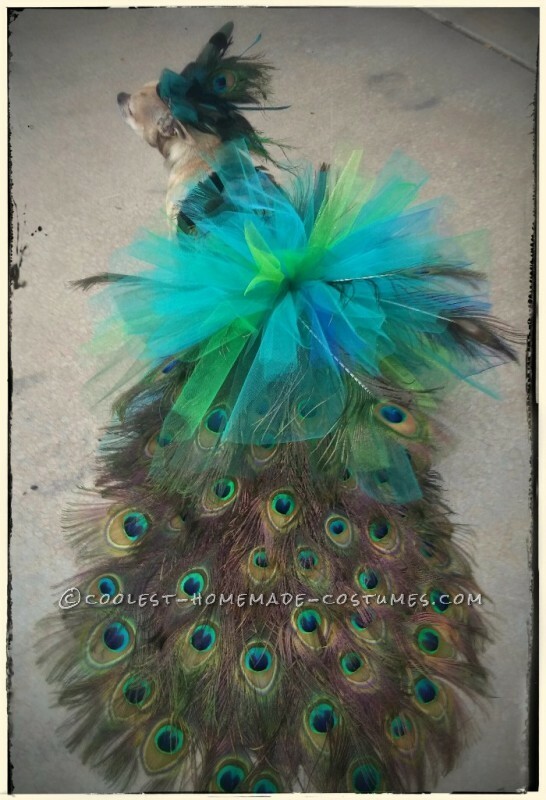 It was decided, she was going to dress up her furbaby in an extravagant, hand-made peacock costume. After all, the crazy dog lady had gone to school for fashion design so she may as well put that college degree to some use. 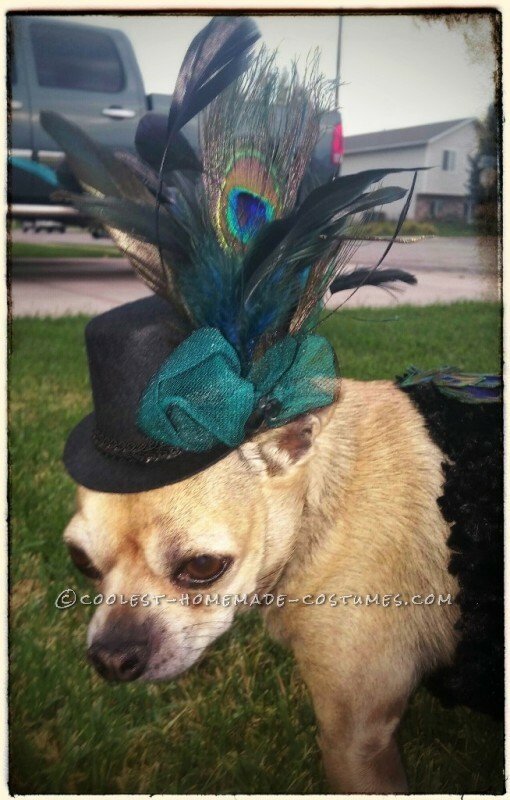 How do you turn a Chihuahua into a peacock? Peanut’s mom went online and looked at dozens of pictures of real life peacocks so she could get a visual understanding of their physical characteristics. As she looked through peacock photos there were some other photos of hats, tutus, and costumes for humans who wanted to “play” a peacock for Halloween. One photo in particular of a hat reminded her of a steampunk style accessory which she thought was a really neat look. Steampunk is a style that incorporates 19th century fashion with a steam powered mechanical flare to create a funky, science fiction look. It was perfect! 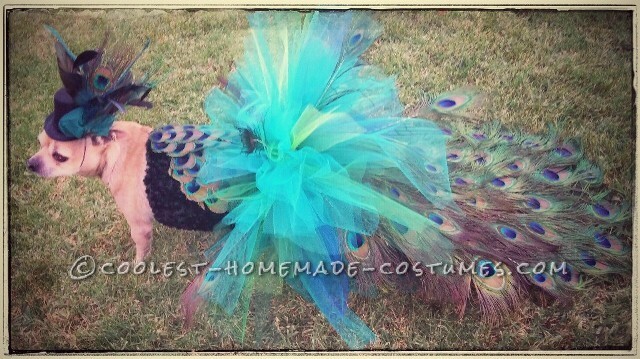 Rather than taking a completely literal approach to this peacock idea she would add a funky flare. Peanut’s mom went through all of the tulle and cut strips in 3 different lengths based on Peanut’s size so the tutu would be proportionate to her body. She cut 5 strips of each color in each length for a total of 15 strips per color. She put the regular crochet headband around Peanut’s waist then pinned the screen fabric to the bottom and freehand drew out the shape of the tail. After taking the headband off of Peanut, her mom cut out the tail in the shape that she had drawn then used regular thread to sew the screen fabric to the bottom edge of the headband. She took the longest peacock feathers and began attaching them to the screen fabric using hot glue. She layered and staggered the feathers all the way up to the edge of the headband, cutting the feathers as needed so they would fit correctly. Once the tail was covered in feathers she began looping the tulle through the crochet of the headband starting with the longest strips closest to the bottom edge and working her way up the headband as she slowly tapered down to the shortest length of tulle. She used the colors as needed depending on how it was looking as she created the tutu. She did not put any tulle on the underside of the headband since this would be under Peanut’s belly and she didn’t want her to have difficulty walking. The tulle only wrapped around ¾ of the headband leaving the other ¼ bare for the underside. After all of the tulle was attached Peanut’s mom took some of the short peacock feathers and trimmed them down to the same length as the tulle and randomly incorporated them into the tutu by gluing the stem to the existing tulle. Be sure to use a low heat setting on your glue gun since tulle melts easily or you can use tacky fabric glue. Since the tutu and tail took up a majority of the regular crochet headband Peanut’s mom used a fuzzy crochet headband for the body of the costume. She put the fuzzy headband on Peanut then positioned the 3 peacock eye feather pads on Peanut’s back so they were in a triangular pattern with the widest point closest to Peanut’s bottom end. The pads were slightly layered upon one another so you couldn’t see the headband underneath. Peanut is 12” from neck to tail so you will have to buy more/less pads depending on your dogs size. After removing the headband from Peanut’s body her mother hot glued the pads into place where she had positioned them while on Peanut. Peanut’s mom took the hat and punched 2 small holes in the brim, one on each side for her to lace the elastic through so the hat would stay on Peanut’s head. Once she adjusted the elastic to the appropriate length she tied knots in the ends and cut off the excess. Once the elastic as in place she glued on the decorative trim around the base of the hat then began creating a decorative cluster of feathers (peacock swords, coque, peacock eye feathers, etc) on just the one side. After all the feathers were glued into place she took some teal tulle and the black decorative gems and added them to the bottom of the cluster. Voila! The peacock comes to life! Peanut’s mom first put the tutu/tail piece around her waist then put the fuzzy headband on over the top of it appears to all be one piece. Then she put the hat on Peanut’s head and her vision had come to life. Not only was it exactly what she had envisioned but it was also easy for Peanut to wear. She took her outside to take pictures and the neighbors all gasped when they saw this masterpiece. “Look at that beautiful tail!” They were in awe of the costume and Peanut strut around like she was on the catwalk, loving all the attention people were giving her.